If you’re looking to add more superfood goodness to your diet, quick and easy Instant Pot Sweet Potatoes are the answer! Sweet potatoes are packed with vital nutrients, including vitamin B6, C and D. They also contain magnesium which is thought of as the relaxation and anti-stress mineral. 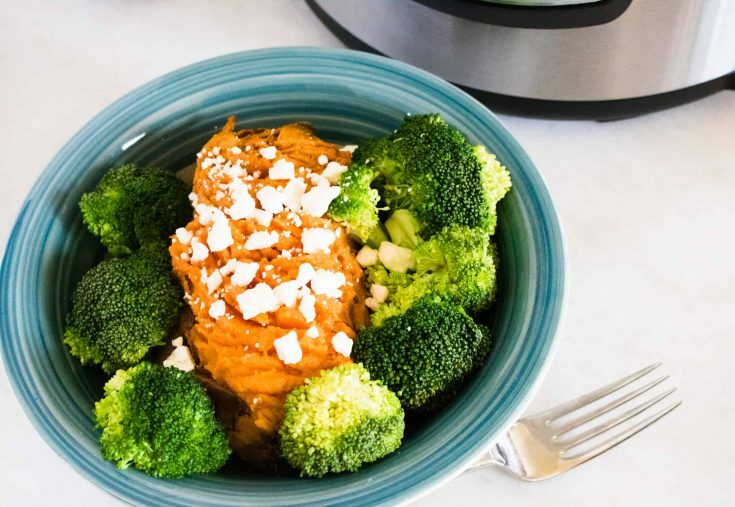 And making Instant Pot Sweet Potatoes couldn’t be more simple and stress-free; just place them in the Instant Pot, set it, and walk away! Once they’re cooked, you can top and serve them anyway you like. To add a little Greek flare, sprinkle some feta cheese on top. Or if you’re in the mood for Mexican, top them with salsa and sour cream. For a hearty and filling entrée, serve with veggies on the side and a big scoop of homemade chili on top. You can even make them a dessert by topping them with marshmallows, or have them for breakfast with a drizzle of peanut butter. The possibilities really are endless! If you Google this question you are sure to come up with plenty of results. 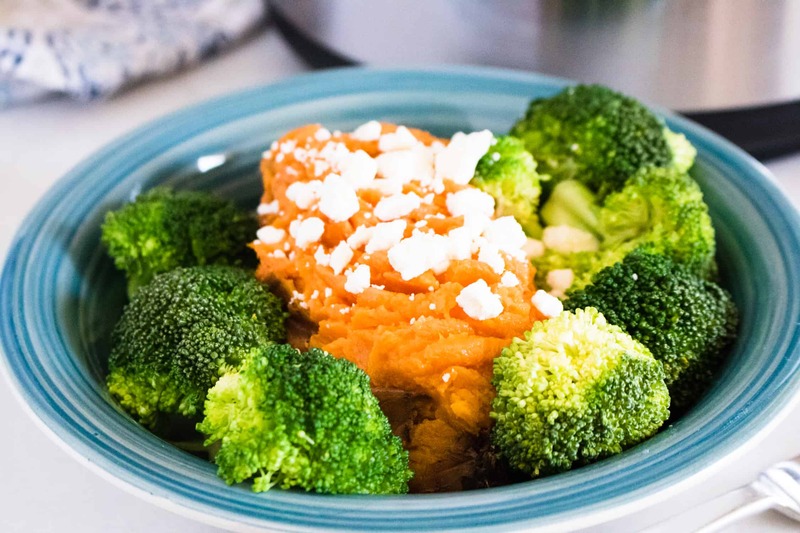 Some say sweet potatoes are better because they are lower on the glycemic index. The important thing to consider when comparing the two is how each type of potato is prepared. Fried potato chips or french fries are less healthy than a steamed potato. So, while both sweet potatoes and white potatoes contain nutrients that provide health benefits, It is how you prepare the potatoes that really matters. While cooking in the Instant Pot is quick and easy, it can sometimes leave behind stubborn stains and build-up. Here’s an easy solution for returning the Instant Pot inner liner (the stainless steel pot) to its original sparkling state. Sprinkle some Bar Keepers Friend in the bottom of the pot, add a touch of water, and give it a scrub with a Mr. Clean Magic Eraser. This simple combination really does work wonders! 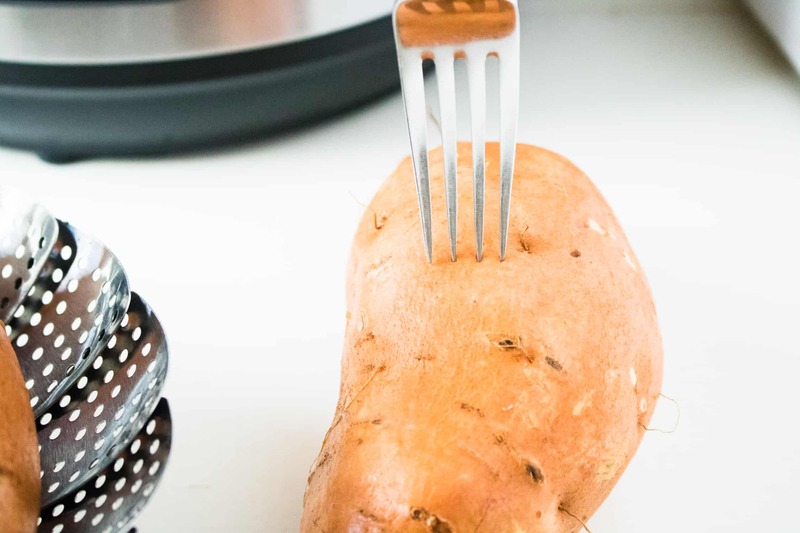 Wash your sweet potatoes and pierce several times with a fork. 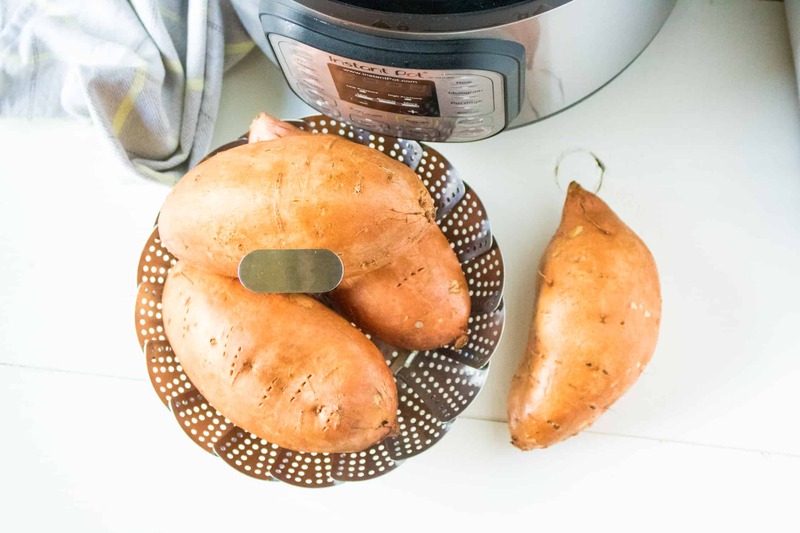 Put the sweet potatoes in a steamer basket, or place on trivet inside the Instant Pot. Set to a manual high time for 17 minutes. When the cooking time has finished, do a natural pressure release, which will take about 10 minutes. Serve with your favorite toppings, and enjoy! 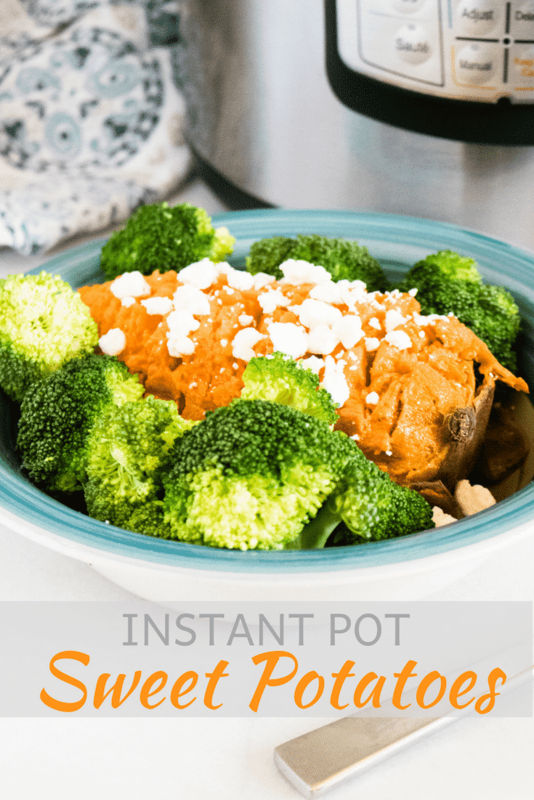 Making this Instant Pot Sweet Potatoes recipe couldn't be more simple and stress-free; just place them in the Instant Pot, set it, and walk away! 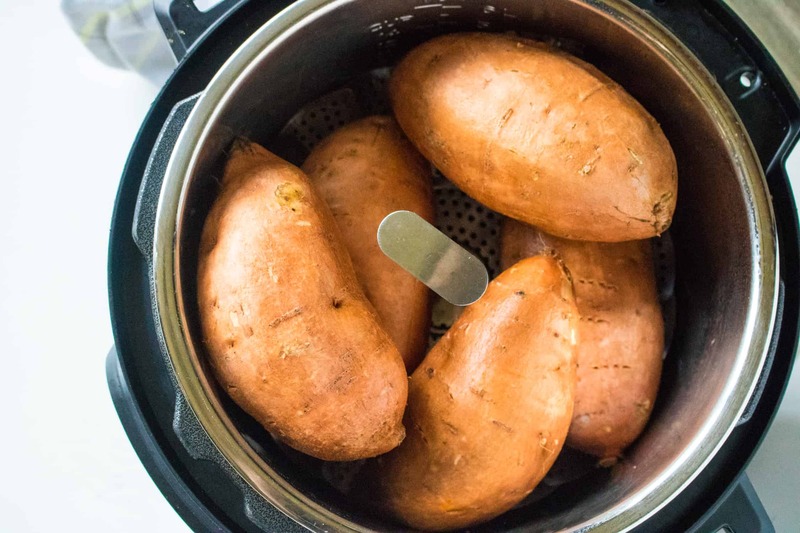 Add sweet potatoes to a steamer basket or place on trivet in the Instant Pot.